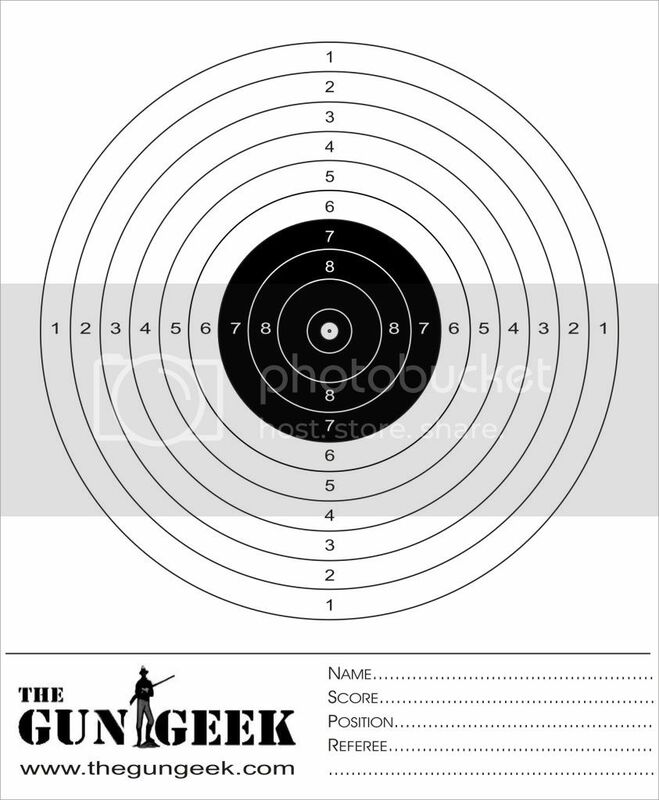 For promotion and feel good factor for TGG members, we present complimentary targets, (20) for each member here on TGG. As of today there are 2200 members and print order of 44000 targets has been given. I need volunteers to pool or distribute targets among the members. 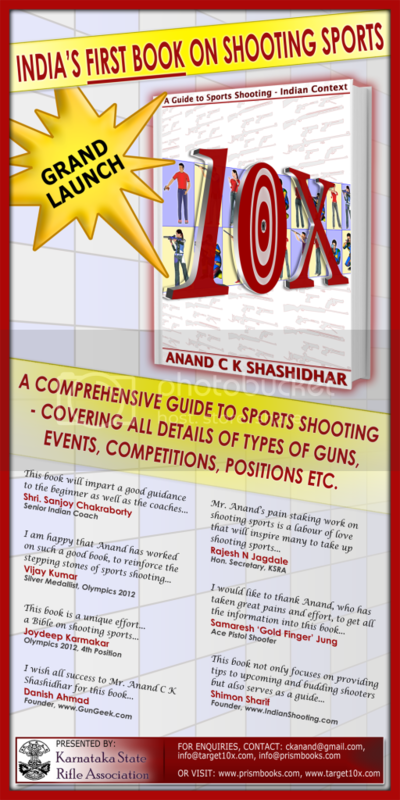 Proud to launch India's first comprehensive book on Sports Shooting. Launched by: Shri BB Ray, Regional Director, Sports Authority of India, Bangalore. Venue: KSRA Shooting Ranges, SAI Campus, Bangalore. .... This book will be sold at a 25% discount for the first few weeks - Only thru online sales. Please mail orders@prismbooks.com for details on online buying. After a few weeks, the book will hit stores all over India. Allahabad HC says RKBA is a Fundamental Right under Article 21! Says "Keeping a fire arm for the purpose of personal safety and security is a mode and manner of protection of oneself and enjoyment of fundamental right of life and liberty under Article 21 of the Constitution." It is good to see that judges and lawyers are begining to understand that arms are a fundamental right under Articles 19 and 21 of the Constitution of India. 1. Heard learned counsel for the petitioner and learned Standing Counsel for the respondents. 2. Considering the pure legal submission advanced by learned counsel for the petitioner, learned Standing Counsel states that he does not propose to file any counter affidavit and the writ petition may be disposed of finally at this stage under the Rules of this Court. 3. The petitioner's application for grant of firearm licence has been rejected by the District Magistrate, Allahabad vide order dated 15.10.2009 only on the ground that petitioner has not given any special circumstance for seeking firearm licence and the said order has been confirmed by Commissioner by dismissing appeal vide order dated 05.08.2011. 4. Learned counsel for the petitioner submitted that he has applied for firearm licence for his personal safety and the said fact has not been found incorrect or false. The respondents have considered the matter in a most arbitrary and illegal manner by misdirecting themselves on certain aspects which are not relevant for the purpose of considering whether firearm licence should be granted or not. 5. Learned Standing Counsel having gone through the impugned orders could not support the same. 6. This Court in Pawan Kumar Jha Vs. State of U.P. and others, 2010(10) ADJ 782 has held that undue restriction on keeping and bearing arms ought not be based on unfounded fear. Licence is normally to be granted unless there is something adverse. "When a fire arm licence is granted for personal safety and security it does not mean that in the family consisting of several persons only one fire arm licence is to be granted. Moreover, this cannot be a reason for denial of arm licence. Fire arm licence can be denied only if the reason assigned by applicant or details given by him in application are not found to be correct but merely because there are one fire arm licence already possessed by one of the family member, the same cannot be denied. Grant of fire arm licence should ordinarily be an action and denial should be an exception. The approach of authorities below is clearly arbitrary and illegal. It also lacks purpose and objective of the statute." 8. The authorities empowered to grant licence under the Act ought not to behave as if they are part of the old British sovereignty and the applicant is a pity subject whose every demand deserved to be crushed on one or the other pretext. The requirement of an Indian citizen governed by rule of law under the Indian Constitution deserved to be considered with greater respect and honour. The authorities thus shall have considered the requirement of applicant with more pragmatic and practical approach. Unless they find that in the garb of safety and security, applicant in fact intend to use the weapon by obtaining a licence for a purpose other than self defence, it ought not to have been denied such licence. I am not putting the statutory power of authority concerned in a compartment since there may be more than one reasons for exercising statutory discretion against applicant but then that must justify in the context of purpose and objective of statute and necessarily ought not be whimsical. 9. Both impugned orders in the case in hand shows that on wholly conjectures and surmises the authorities have denied petitioner's claim for fire arm licence and have rejected his application in a most arbitrary manner. The two orders, therefore, cannot sustain. 10. In view of above, the writ petition is allowed. The impugned orders dated 15.10.2009 and 05.08.2011 are hereby quashed and the matter is remanded back to the Collector concerned to consider the same afresh in accordance with law and in the light of observations made above and pass a fresh order within a period of two months from the date of production of a certified copy of this order. Shooters - ace and aspiring - can no longer use air guns, air pistols and air rifles for target practice without getting a proper licence, if they are not members of a military mess, club or association. The Delhi high court has quashed a 1962 government notification that exempted these arms from al l the regulations and controls under the Arms Act, 1959, including the requirement of a valid licence. A Bench of Justice AK Sikri and Justice S Muralidhar rejected the NRAI's argument that air guns, air rifles or air pistols used for target practice were not firearms as defined under the Act, but were merely toys and as such these did not fall under the purview of the licencing regime. "It is safe to conclude that air guns, air rifles, air pistols are not mere toys…and they are very much subject to the provisions of the Act, being firearms," the Bench said. On a petition filed by People for Animals, the HC had in 2002 quashed the July 13, 1962 notification exempting air guns, air rifles, air pistols from the requirement of licence. PFA had argued that these arms were used for killing or maiming animals and birds. But NRAI filed a petition seeking review of the order on the ground that these were not firearms and therefore licence could not be mandatory. Maintaining that no citizen had a blanket right to carry firearms, the court said nobody; even NRAI members could claim a right to secure a licence. "They have, at best a right to apply for, and be considered for the grant of a licence, subject to fulfillment of the prescribed qualifications." PFA counsel Raj Panjwani said, "Those having air guns, air rifles or air pistols would need to apply for licence." He welcomed the verdict, saying, "the judgment is a harmonious balance between needs of the sports fraternity and the obligation of citizens to show compassion towards animals." The court took note of the subsequent developments in the field of law, including the enactment of Wildlife Protection Act, 1972 to justify its decision. Rifle shooter Shimon Sharif, who has participated in the 2003 World Cup in South Korea, said it was a major setback for the shooters. "The NRAI should have pursued the case much more professionally." In the land of Mahatma Gandhi, Indian gun owners are coming out of the shadows for the first time to mobilize, U.S.-style, against proposed new curbs on bearing arms. When gunmen attacked 10 sites in Mumbai in November 2008, including two five-star hotels and a train station, Mumbai resident Kumar Verma sat at home glued to the television, feeling outraged and unsafe. Before the end of December, Verma and his friends had applied for gun licenses. He read up on India's gun laws and joined the Web forum Indians for Guns. When he got his license seven months later, he bought a black, secondhand, snub-nose Smith & Wesson revolver with a walnut grip. "I feel safe wearing it in my ankle holster every day," said Verma, 27, who runs a family business selling fire-protection systems. "I have a right to self-protection, because random street crime and terrorism have increased. The police cannot be there for everybody all the time. Now I am a believer in the right to keep and bear arms." Verma said he plans to join the recently formed National Association for Gun Rights India to lobby against new gun controls that the government has proposed, blaming the proliferation of both licensed and illegal weapons for a rise in crime. Although India's 1959 Arms Act gives citizens the legal right to own and carry guns, it is not a right enshrined in the country's constitution. Getting a license is a cumbersome process, and guns cannot be bought over the counter -- requirements that gun owners describe as hangovers from the colonial past, when the British rulers disarmed their Indian subjects to head off rebellion. In December, the Ministry of Home Affairs proposed several amendments to the Arms Act that would make it even harder to acquire a gun license, restrict the number of people eligible for nationwide licenses and curtail the amount of ammunition a gun owner can amass. An official said that the ministry has called for public input. But in the meantime, the proposals have given rise to a nascent gun rights movement modeled on the strategies of the United States' National Rifle Association and echoing its rhetoric of civil rights, dignity and self-protection. "We are outraged. We are not murderers. Instead of going after real criminals, the government is indulging in window dressing by bringing in gun control laws that target law-abiding citizens who have licensed guns," said Abhijeet Singh, 37, a software engineer who started Indians for Guns and is the coordinator of the new gun rights association. "We want to remove the stigma on licensed gun owners," Singh said. According to the National Crime Records Bureau, 87 percent of murders by firearms in India in 2007 involved illegally held guns. There is no official tally of legal gun owners, but Singh cited a rough estimate of 4 million to 5 million. Last week, the National Association for Gun Rights India began meeting with lawmakers and consulting lawyers in a bid to stall the proposals. The group's president is a 39-year-old lawmaker, Naveen Jindal, who studied at the University of Texas business school in Dallas. Inspired by American students' displays of patriotism, Jindal earlier launched a successful campaign for Indians' right to display the national flag outside their homes and offices. Indian security experts appear dismissive of the group's efforts. "There is no place for a gun rights movement in India," said Julius Ribeiro, a former police officer who comments on security issues. "That kind of debate may work in America, but it will not work here, because laws are misused and guns can easily fall into the wrong hands. It can get dangerous in India." Gun rights advocates respond -- using language familiar to Americans -- that guns are a deterrent to crime. "An armed society is a polite society," said Rahoul Rai, a member of the campaign. He said the movement also reflects the rise of an Indian middle class that can "voice its fears about rising crime, interpret the constitution to articulate their rights to self-protection and bring like-minded people together through technology." Shahid Ahmad, who runs a Web site called TGG , said the process of getting a gun license in India is so burdensome that it encourages corruption. To hasten the process, he said, many applicants ask politicians to put in a word in their favor, or attempt to bribe officials and police officers. To illustrate the point, gun advocates refer to a 2008 incident in the state of Madhya Pradesh. The clamor for gun licenses was so high, according to news media, that officials tried to induce men with large families to participate in a vasectomy program by promising a license in return.